For 3000 years (beginning in 3500 b.c. ), kingdoms rose and fell, empires expanded and contracted, outsiders conquered and were repelled. During that time, three dominant civilizations held center stage at various times. 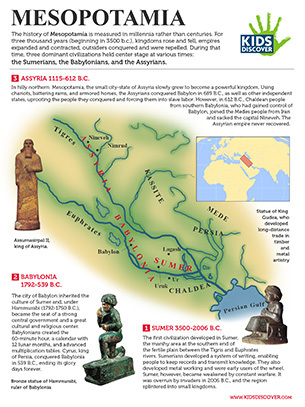 Download this free lesson sheet on Mesopotamia for kids detailing the Sumerians, the Babylonians, and the Assyrians – perfect for the classroom or home!